The five years 1888-1892 were defining ones for Homestead. This was the period in which Homestead’s growth since the beginning of the decade picked up speed and decisively turned the “industrial suburb [into] a mill town both physically and mentally” (source). In 1880 the town had just 576 residents, but 7,000 by 1888 and 8,000 in 1890, at which point it was quite proud to have overtaken Braddock to become the fourth-largest town in the region (behind Pittsburgh, Allegheny (now the North Side, but then a separate city from Pittsburgh), and McKeesport). Physically, the town began to undergo a number of infrastructure improvements to make the town more modern, more livable, cleaner, and safer. The town began to replace its rotting board walks with proper paving and curbing, though not without financing issues, and overnight everyone became an expert on the proper grade for streets and the ideal material for paving. Natural gas torches appeared on the streets and were later augmented by electric ones, though it took two tries for this “experimental” technology to stick (3/15/1890). 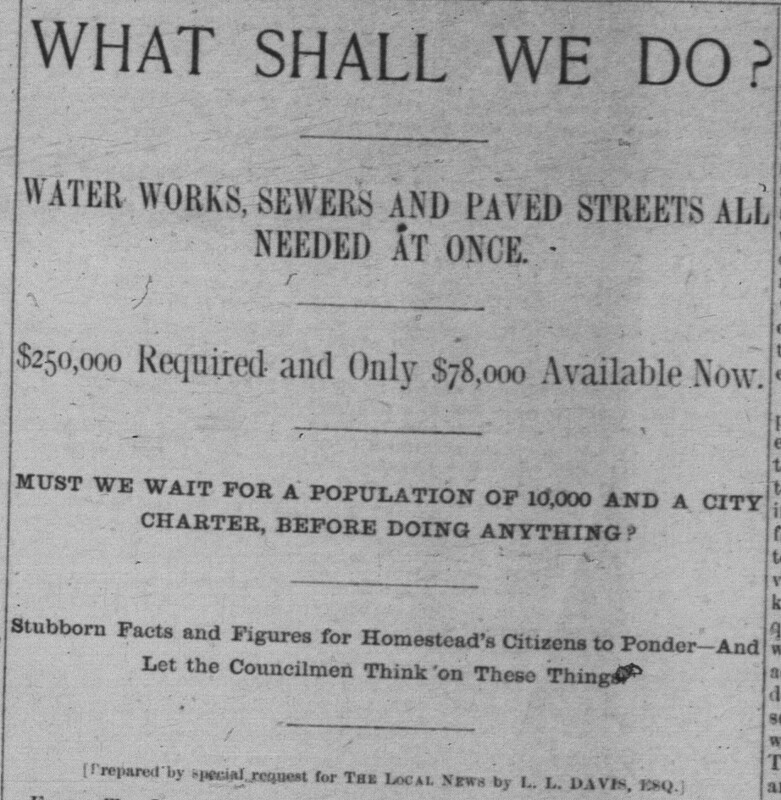 Gas lines were run, sewers were dug, water works were installed, and some houses and businesses connected to it. More train companies added tracks through the town, and the existing company added more tracks. Planning for a bridge and electric railways to connect the town directly to Pittsburgh gathered momentum. A proper fire company was organized, as was a health department. The growth in population led to organizational and economic changes as well. New schools were built, though the number of school children grew faster than the buildings to accommodate them — and the high school graduated its first class. Churches were built, and societies were founded. Houses were numbered, even — this was one man’s job! — and enabled the first city directories to be published starting 1890. Every year the holiday season for the town’s merchants was better than the last. Every season the building activity surpassed the previous, and there was a constant demand for houses to rent that could not be met. “The march of improvement keeps up. The day of small things for Homestead is fast passing away,” wrote the editors in 1888 as all of these changes got underway. Anyone who frequents the public places of this town, cannot help but be struck with the number of new and strange faces to be seen, and the different in nationality, manners and dress. There is a heterogeneousness about our public gatherings which impresses one with the newness of our population. It is made up of people from the four corners and has not become assimilated…Among the several thousand who have come into our town during the last year or so, are many excellent people who will eventually become prominent in our social and business interests. but within a couple years the paper began to realize that all these rowdy young steelworkers were beginning to change the town’s character. An article from 9/7/1889 complained about “drunken [brawls] and free [fights]” of the men on Saturday evenings after payday, and an article from 6/28/1890 lamented “scenes disgraceful and revolting…The investigation made by a representative of this paper shows that the infractions of decency are confined to the Hungarian population, mostly residing in the Second Ward, several hundred being huddled in a few houses.” The article goes on to describe the behavior of these “mongrels,” concluding, “if these things were done by other than Hungarians, it would be a disgrace to the community.” An increase in robberies in the late 1880s required the addition of more policemen to the town. This post views all of these changes through the imperfect lens of the town’s weekly newspaper. The editors seemed to view themselves as town boosters, so for the most part little news about the wild “Huns” and “Slavs” appeared. “Every issue of a newspaper is a photograph of the town in which it is published,” they wrote on April 5, 1890, and they pointed their camera mostly at that which reflected Homestead best. With weekly coverage the overall amount of news the paper conveyed is low, but one rarely sees ethnic names in the paper during this time, and a regular column of local briefs, which mentioned the doings of various socially acceptable Homesteaders, entirely excluded even those Jews who were already successful business men (though as you’ll see below, their business activities forced attention in other ways). The kinds of petty crime articles that later would feature them as plaintiffs or defendants were largely not written in this period, both because the town was just beginning to acquire its wild character and because, I suspect, the editors didn’t want to advertise such negativity. The general feeling the newspaper conveys during these years is one of optimism — a boom that cannot be stopped — until the famous steel strike of July-November 1892, an event so momentous in Homestead’s history that even today its residents understand themselves in relation to it. As you’ll see in the remainder of this post, the Jewish residents of Homestead who made it into the paper during this period were those who were the most economically successful, therefore the most connected to the life of the town as the paper covered it. But many of the others began as peddlers or hucksters, leaving very few traces of their origins in this period. Though peddling was a standard stepping-stone for Jewish immigrants all across Western PA to save money to open their own stores, from the very beginning there was great prejudice against this profession. It’s interesting to read how it was viewed to understand how our ancestors were viewed in their early years. The peddler’s license ordinance is strict enforced in the borough. Al the peddlers are required to pay a license of fifty cents per day. From June 11th to July 24th, forty-four days, about forty license were issued, bring into the borough treasury $20.00. We believe the oddject of the license is to discourage the peddlers and turn the trade to home dealers. Whilst they growl a great deal about paying it, the fee does not appear to diminish the number of peddlers. On 12/6/1890, for example, Paul Prosinki was arrested for peddling without a license. He was fined $1.80 — three times the cost of a license — and costs. For that money he could have bought an accordion at Segelman’s store (see ad below). There are a good many features about the practice of peddling from house to house, indulged in by itinerant merchants, that are highly objectionable. These peddlers annoy people who do not wish to purchase by ringing their bells, or opening their doors unannounced. They are persistent that it is next to impossible to get rid of them, and half of those who do buy from them are actually compelled or forced to do so. If this class of traders could be kept out of the town altogether it would save the people a good deal of annoyance. On 10/22/1892 and ordinance was passed “[increased] the license fee for all kinds of peddlers and street hawking, but includes solicitors for orders and agents selling by sample or otherwise, a class of merchants which heretofore were not reached by the Ordinances.” This ordinance did not have the desired effect, and the complaints against the peddlers would continue through the decade. The years 1890-1892 before the strike were a period of great building activity. New tracts of land came on the market regularly — former farmland or private estates broken into lots and sold — and while some went to industrial purposes, many new houses were built as well… and Homestead’s earliest Jewish residents too park in the activity. This was one of the biggest surprises for me — how early Homestead’s Jewish residents became land owners and builders (and also, I think, landlords) in addition to running the businesses I knew them by. October 26, 1889: An article listing the over one hundred new houses built since the summer mentions that S. Markowitz built a 2 story frame house on Heisel street for $1,625. 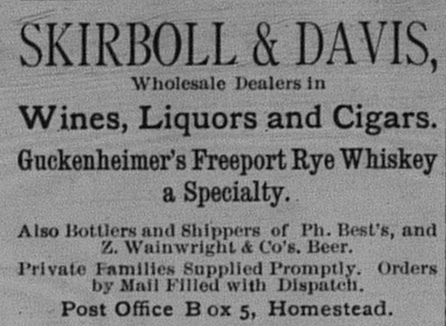 December 14, 1889: An ad for the Bost brothers’ grocery mentions that it is located in the Skirball building. May 3, 1890: An article listing new building permits for the mont of April mentions that Henry Markovitz spent $50 on a permit to build a one-story frame on Fourth avenue, near Dickson street. A real estate agent published ads listing people who bought lots in a tract of land that had recently gone on the market. 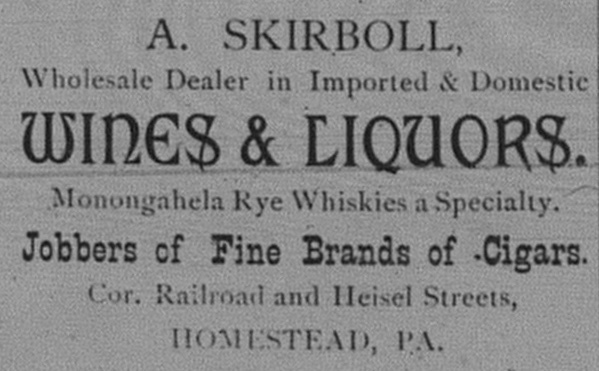 Starting with the November 1, 1890 ad, the name of Samuel Markahitz appears for having bought lots 53 and 54 for $1,100. These lots were on the north side of Second Avenue between Dickson and City Farm Lane. Ordinance officer Wilkinson signalized himself this week by making five arrests. Residents of the Third ward have been annoyed of late with cows and horses running at large and many depredations are reported. The ordinance officer made several attempts to capture some of the animals during the day time, but he always found some boy or other watching them as they claimed and he could not take them in. On Wednesday night he thought he would take a stroll through the Third ward to see how the stray animals were putting in the time. At the residence of D.R. McClure he found a bay horse in the yard nipping the flowers and tramping the grass. He immediately placed the horse under arrest and led him to the public pound. It belonged to a Mr. Markovitz, a Homestead huckster. Continuing his tramp the officer found four cows in various parts of the Third ward all of which he took up. Three of them belonged to Thomas Sheridan of the township, and another to George Jeffries, of West street. The animals were kept in the pound for a couple of days when they were claimed by the owners and the fines paid, amounting to $1.25 for each cow and a dollar for the horse. Some of an explosive was discharged in front of Markowitz‘s grocery store on Heisel street a week or so ago, shattering the windows badly and otherwise damaging the surroundings. It is supposed to have been done by a rival in business. The Hungarians of that neighborhood have been having lively times of late. The Sunday disturbances are getting obnoxious to the more peaceful neighbors. It is time the authorities should put a stop to such work. Max Markowitz, a Heisel street grocer, who also runs a huckster wagon, met with an experience on Tuesday afternoon which will last him a long time. He was crossing the P. McK. & Y. railroad at West street, when the express came along and struck and killed the horse, upset and broke the wagon, and nearly put an end to Markowitz. The horse was thrown upon him, and although he was able to extricate himself and walk home, the shock afterwards prostrated and rendered him unconscious for a time. He suffered from concussion of the brain. He is now out of danger but his escape from instant death was narrow indeed. West street is a dangerous crossing on account of the street sloping towards the track on both sides, and teams get started down and cannot stop. The cut and houses makes (sic) it difficult to see approaching trains. 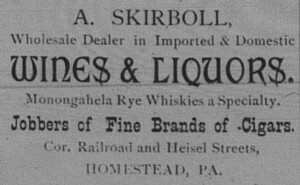 We traditionally associate Jews with the liquor business, but in PA starting in 1888 this became a tricky business with the passage on May 13, 1887 of Brook’s Law, which govern retail and wholesale licenses. It represented PA’s capitulation to the national “high license movement” which became a focus of the temperance movement in 1881. In giving the power to grant liquor licenses to court judges, the law also ended up sharply restricting the number of licenses as well… with the side effect of creating a huge speakeasy problem. “In Pittsburgh, there were an estimated seven speakeasies for every licensed saloon”(source). Homestead seems to have suffered at a similar rate. At any rate, Brook’s Law was the state’s major piece of alcohol-control legislation until Prohibition (though in June 1889 the temperance movement tried to past full prohibition in the state as there was in Maine, Iowa, and Kansas), and after a Supreme Court challenged failed in Jaunary, 1888 was the first year Homesteaders were affected by it, including a member of our community, A. Skirball, who apparently had had a saloon? and also sold wholesale? the previous 6 years. The paper followed the proceedings with great interest. On 1/21/1888 it explained the process — applications due 2/10, license court to commence third Monday in March, and licensed granted to start 5/1. “If the new law is followed to the letter there will be very few saloons left in Homestead,” it concluded. There were twenty-five applicants from Homestead, fifteen fewer than the number of saloons then open (2/18). County-wide, there has been 2,7000 licenses, but only 1,000 applicants, which the paper attributed this change to the “stringent provisions of the new law in regard to bondsmen, and the provision given the court full discretion as regarded the number, etc. Petitions against the applicants will be presented fro most every district in the county, and it is probable that many applicants will be refused on that account” (2/18). A scandal broke out in late March when the Council of Homestead passed a resolution “asking the license court to grant a license to every applicant in the borough who complies with the law, for the reason that the borough treasury will receive $90 from each license granted, which money is needed for improvements” (3/24). “Not a single word of approval has come from any source…Nearly all agree now that it was an unwise move, as a matter of policy, leaving out of consideration the moral issue involved” (3/24). As the hearings got underway, the paper reported on the applicants in some detail. On 4/7 the paper even printed testimony to show how poorly Homestead applicants were faring, including Skirball! Elsewhere in that issue it reported that one man who claimed not to drink was faced with his son saying that “he gets drunk and abuses his mother,” and a woman who also claimed to be sober had to counter testimony that someone saw her drunk eight or ten times, and even the judge accused her of drinking before coming to court (4/7). I have had some piteous appeals on the part of some who were refused. Wives have pleased with tears for a license to enable the to make a living for their family. These appeals have deeply touched me. It is far more pleasure to grant favors than to refuse them. But when duty demands, person feelings and inclinations give way. Besides, I cannot forget the scores of letters I have received from suffering wives and broken hearted mothers, pleading for God’s sake to save the, their husbands, fathers and children from the awful curse of saloons…My sympathies are with the laboring men and their families. I guess he hadn’t yet reached the “acceptance” stage of mourning? The next section how in June Skirboll began finding a new line of work, but in this section we have four more years of license court proceedings to get through… and you’ll see he didn’t give up trying to return to his original profession. 1889 saw a drop in applicants county-wide from the previous year — 1,361 total, or 192 fewer — but Homestead saw an increase from 33 to 36 applicants, which included all of those currently with licenses and most of those who were refused last year, including Skirball. The paper refrained from reporting on the court proceeding as it did the previous year, only summarizing “most of the applicants cut a sorry spectacle before Judge White” (3/23). The results came out in the 4/27 issue. Skirball was once again refused. Homestead’s 8 licenses were more “according to population than any other place in the county…one saloon to every 750 of the population.” Again noting without any sympathy that people were losing their livelihood, the paper also wrote, “It is said that one of Homestead’s knocked-out saloon applicants cried over his misfortune. It seems that these men are very tender-hearted after all. Their business, however, is a sort of crying one–a crying evil” (4/27). By the end of this year the problem of speakeasies had become so significant that all believed the law needed to be patched. In 1890 there was even less coverage of the liquor license proceedings, but the waning interest turned out to be inversely proportionate to the Homesteaders’ success in the license court. The paper complained, “Last year Homestead got eight [retail] licenses, but one was revoked. This year it got eighteen. That Homestead should obtain so many licenses is a little strange considering that other boroughs and city wards did not fare so well.” They naively hoped that “even the increased number of licenses cannot be said to be too many for the good order and peace of the community if they will do away with the objectionable ‘speakeasies’ and jug trade that developed last year” (4/26). They noted in particular that the second word “has been noted the past year for its number of ‘speak easies,’ which became a great nuisance. It will now have as many saloons as the entire borough had last year” (4/26). Skirball did not apply for a license this year. The licenses brought the borough $1539.69 in revenue (5/2/1891). In 1891 the coverage declined even further, though the number of applicants increased after last year’s surprising success. “Samuel Markowitz, Heisel street and P. McK. & Y. railroad” was amongst the 47 retail applicants, and “A. 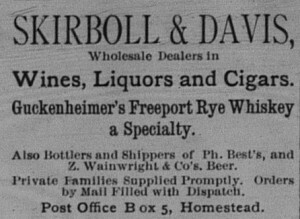 Skerball, Eighth avenue,” was amongst the 16 wholesale applicants (2/14). Others included Levi Myers, Eighth avenue; Louis Amshell, Eighth avenue and Heisel street (brother-in-law to I.S. Grossman); Berman Benstein, Eighth avenue and McClure street. 23 retail licenses and no wholesale licenses were approved (5/2). Though an increase of five, the paper allowed that the number of retail licenses “is generally thought to be about the proper number for a town of this size,” explaining that when the number was previously too low, “speak-easies flourished everywhere.” For wholesale the story was different; last year “every provision of the license law was systematically and fearlessly violated,” so the wholesalers were getting what they deserved. (5/8) The total revenue was expected to be nearly $2000. 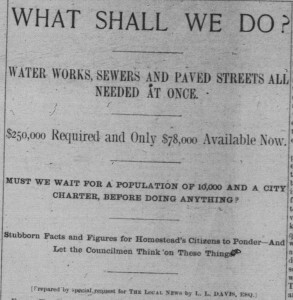 In January of 1892 the paper predicted that the number of licenses in Homestead due to the adoption of “the Philadelphia plan,” whatever that was. Retail applicants included “Samuel Markowitz, No. 513 Heisel street,” and wholesale applicants included “Abraham Skirboll, No. 513 Eighth avenue,” “Myers & Simon, Nos. 517 and 519 Eighth avenue” (future address of I. Grossman’s store), and “Jacob Levy, No. 513 Eighth avenue.” None succeeded; Homestead got 22 retail licenses of 49 applications — a decrease — and one wholesale license of 4 or 5 applicants (4/23, 4/30, 5/7). Mr. A. Skirball, a well known citizen of Homestead, is this week in New York City, for the purpose of buying a stock of clothing and furnishing goods. His store will be in the new building recently erected by Mr. McWhinney, on Ann street. Mr. Leopold Blume, who previously conducted a store for Fisher & Co., will be the principal clerk. Mr. Skirball has the qualities of a good business man and will likely make his enterprise a success. 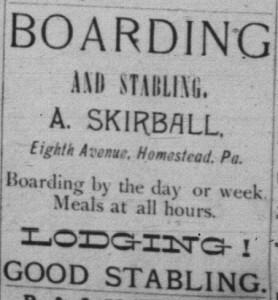 June 9, 1888: The advertisement for Skirboll‘s new store. (Click to view it larger.) It appeared on the back page of the paper through the first week of July. Interestingly, the period that this ad ran overlapped entirely with the 1889 license court applicant and hearing process. I can’t help but wonder if the ad for this business, which was quite unlike the clothing and shoe stores Skirball otherwise ran, had something to do with improving his chances in license court. Got in Line With the Rest. Mr. R. Segelman, the Sixth avenue jeweler, makes his first appearance to-day in our advertising columns and offers special prices for holiday presents. 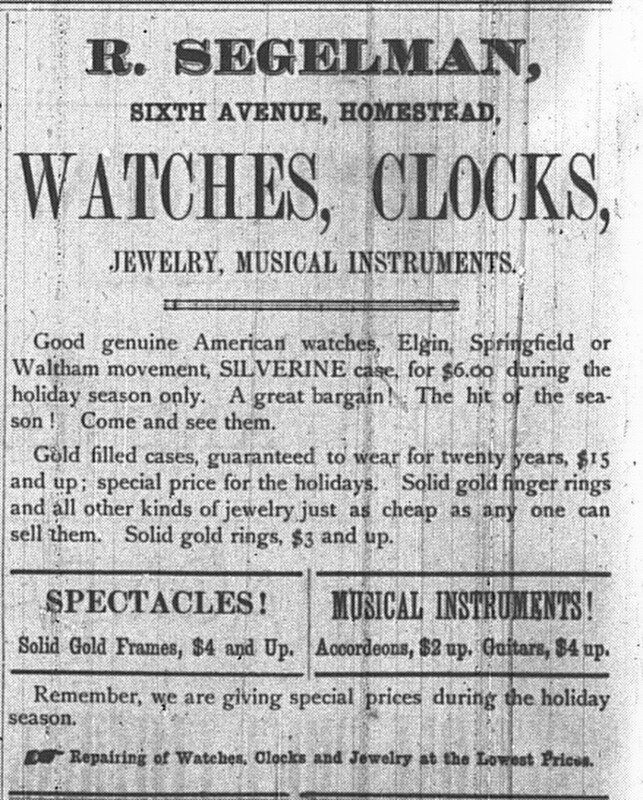 This ad for Segelman‘s jewelry store ran from 12/7/1889-1/4/1890. For all of the issues but one, it was on the front page of the paper! From January 18-February 8, 1890 this ad for Segelman‘s jewelry store ran. Two points of context: First, Christians took their Sabbath very seriously at this time as a day to refrain from commerce and behave morally. This issue periodically flared up in the news, like when an evangelist charged an entrance fee to his Sunday revival, or when young people would take rowdy boating trips for pleasure. Second, this Captain Wishart is likely the same who piloted the towboat Little Bill, notorious for having pulled one of the barges full of armed Pinkertons during the 1892 strike. He was quoted in numerous papers across the country — and later swore an oath at the inquest — that because his barge was fired upon by the mill workers, “he became angry, and seizing a rifle himself began firing at the crowd on the shore” (San Francisco Call, 7 July 1892). Having aided the Pinkertons and shot at the strikers could not have endeared him to his neighbors. At any rate, I can’t help but wonder what happened to necessitate this article in the first place. Did one of the Jewish stores stay open on a Sunday? Did one of the Jewish proprietors protest that this law needn’t apply to him? Although this article doesn’t express the sentiment, elsewhere I got the sense that the issue was less one of imposing religious beliefs on others than of requiring everyone’s efforts to create an appropriately subdued atmosphere. Update: It seems this Captain Wishart was quite the crusader! He headed something called the “Law and Order Society,” and one of their chief targets was violators of the Sunday Laws. “His Sunday detective work was about the only labor performed in Pittsburgh,” joked a Pittsburgh paper on 7/23/1888 about his zealous efforts. Throughout the time period of this article, he is involved in prosecuting saloonkeepers, Sabbath violators, and others. He seems to have been quite effective, he and “his corps of reformers.” “Life is scarcely worth living in the city on Sunday” since he got involved, claimed the paper on 7/2/1888. I would guess, then, that this issue wasn’t against Jews per se, but against all Sunday violators, of whom the Jews had a unique excuse. September 26, 1891: A botched bris! Oiy gevalt! A Hungarian-Jewish feast attracted attention on the south side of Sixth avenue yesterday, on account of the songs and merriment. A Rabbi from the city was present to perform the ancient Jewish rite. In the performance of the ceremony an accident happened and a physician had to be called in, and it is said he had considerable difficulty to save the child’s life. April 27, 1889: “The ‘Young Americans,’ of Homestead are ready to play with any club whose members are not over twelve years of age. The club is composed of the following great players: Gus Felt, Frank Armor, Wat. Faust, L. Miller, Soup, Abram Seigleman, George Glasser, Tom Emry, Andy Dale and Jas Porter.” This is a very rare and early example of social mixing. December 1, 1892: Mollie Markowitz was listed on the on honor roll for not missing a day of school during November.